If you are looking for web tutorial on How to make Facebook like Header Notification in PHP by using Ajax JQuery with Bootstrap. In Facebook we can see any type of Notification alert has been view on page Header. 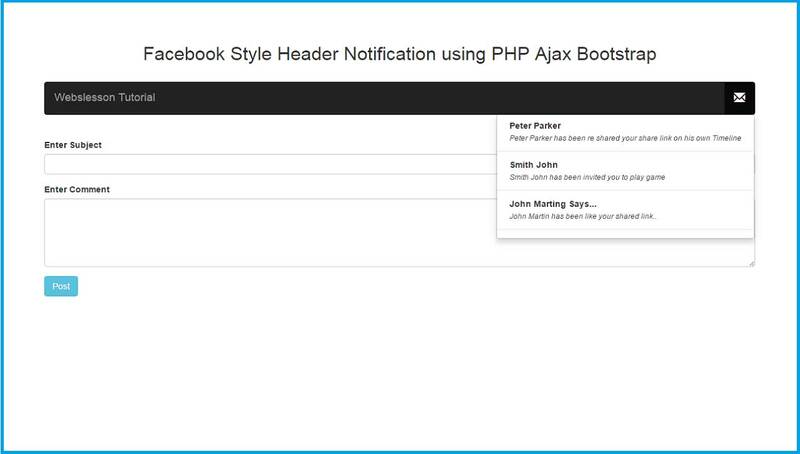 So We have make Facebook style Notification Popup using PHP Script with Ajax Jquery Bootstrap. By using this feature we can display latest alert on page header automatically and user will be notify by latest alert. In this post we have display notification on page header. First of all notification means what are the activity done in our system and notify that activity to user. So user can be updated regarding what activity has been happens in the system. So PHP Notification alert when new record is inserted into system and then after user will be notify by notification count has been appear on page header. So when user has been seen notification alert then count has been remove from the page header that means user has been seen that notification. So this is very helpful feature in any web application and user will be updated with new data. Here we have make simple PHP Notification system like Facebook. Now lets start discussing on How to make Facebook like Notification dropdown by using PHP Ajax JQuery with Bootstrap Framework. This comments table with four column like comment_id, comment_subject, comment_text and comment_status. In comment_status column we have integer data type and so when new record inserted then in this column it will insert zero, here zero means it is unread and when we will see notification then this will be updated to one, that means this records has been read by user. This is our index page and on this page we have use Jquery and Bootstrap Framework. On this page we have make one Header by using Bootstrap CSS Library. For display Notification in dropdown format, we have use Bootstrap dropdown class. By using this class we will display unread notification in dropdown format. Under header for display figure of unread notification we have define into span tag with class count. In this tag we have display unread notification figure. In this post for get Notification we have make one simple form for create notification. So when this form has been submitted then new notification has been created and display on header. For load notification on page load, so we have make on jquery function load_unseen_notification(), when page has been loaded this function will be called and it will display notification on page header. In this function we add one view argument with blank value. So When this function has been called without argument, then this function will only fetch notification from Mysql table but when when this function has been called with any view argument value then this function will fetch notification from table and it will update all unread notification column like comment_status to zero to one. That means all notification has been read by user. Then after we have write jquery code for submit form data to myql table. When form has been submitted then new notification has been created so for display that notification we have called load_unseen_notification() function under Ajax request. Now when we have click on notification icon then number of notification label has been remove from header. So we have write jquery code on dropdown-toggle class on click event. Here when user click on for see notification, so here we have first clear count class in which we have display notification number by using html method with blank value. And for change the status of notification from unread to read, we have called load_unseen_notification() function with argument view is equal to yes, that means this function will not only fetch notification data but also it will also update comment_status column value to zero to one. For get automatic notification on web page without refreshing page, so we want to called load_unseen_notification() function on regular time interval. So we have use setInterval() method with five thousand milisecond. This method will be called load_unseen_notification() function on every five second. And it will display notification on web page. This page has been received request from load_unseen_notification() function. If this page received function with value of argument then it will also update value of column_status column value from 0 to 1. Here zero means unread notification and 1 means read notification. After this function has been fetch last five notification data from table and send to function. In this function it will also count total of unread notification also. This page has been called when form data has been submitted then this function first clean form field data and it will insert into comment table. So We hope you have understand this topic Facebook Like Live Notification by using PHP Script with Ajax JQuery with Bootstrap. If you have any query regarding this web tutorial, please comment your query in comment box. If you like this tutorial please share with your friends or even you can also share on social media also.